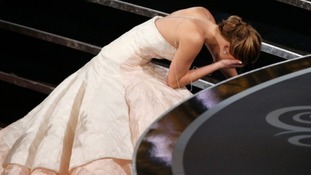 Jennifer Lawrence took a tumble at the Oscars as she made her way to collect the award for Best Actress. The 22-year-old, who won for her performance in Silver Linings Playbook, held her head in her hands after tripping up the stairs in her flowing white and pale pink Dior gown. She was then helped the rest of the way by French actor Jean Dujardin, who was presenting her with the Oscar. After regaining her composure, a smiling Lawrence told the audience, "You guys are just standing up because you feel bad that I fell over and that's embarrassing". Speaking backstage after the incident, Lawrence said: "What went through my mind when I fell down? A bad word that I can't say". When asked backstage what happened the Oscar-winner blamed it on her gown. She told a reporter, "What do you mean what happened? Look at my dress! I tried to walk upstairs in this dress, that's what happened".